Below is a brief introduction into how to use tuning forks on arthritis and painful joints to reduce pain. If nothing else, sound therapy will cause no harmful side effects. It is a gentle, loving and soothing modality that enriches both the client and the practitioner. I recommend using the adjustable tuning fork while working through the examples in the book. Order both the book and the adjustable tuning fork together and pay only $30 plus $7.99 postage and handling. The adjustable tuning fork is a convenient and affordable way to begin your sound therapy journey. Simple unscrew the black plastic screws located on either side of the tuning fork and slide the 'weight' to the line of the frequency that you want. Then, tighten the black plastic screw and that is it! This tuning fork has the same quality as those in the basic beginner set. You can also choose to use two different frequencies at the same time thank to this tuning fork. Explore ALL of your possibilities. Cost: $32 plus $10.99 postage and handling inside of the United States ONLY! Covered in this book is the History of Tuning Forks and the concept behind Sound Therapy. Also included is how to use tuning forks on joints and pain areas of the body, in addition too, points on the spine to relieve backache. A more in depth book on using tuning forks on the bones, joints and discs of the body should be available in late January, 2007. Keep an eye out for it. 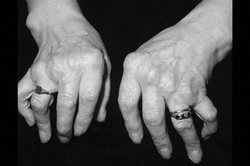 Arthritis comes from the Greek word arth-meaning “joint”, while itis-means “inflammation or infection”. Thus the word “arthritis” means “inflammation of the joint”. Arthritis is a general term often used for a variety of joint diseases that are usually characterized by inflammation, pain and swelling. The confusion comes in with the fact that many kinds of arthritis do not involve inflamed joints. It may be the ligaments, the tendons, or even the muscles near the joints that are affected. So, a better definition of arthritis might be, “a problem with the joint, ligaments, tendons, or muscles near the joint”. Order the Book only-$12.99 plus $4.99 postage. Save Money~Save a Tree and order the book emailed to you.